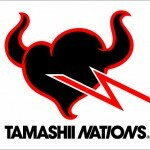 A pair of new Tamashii Web Exclusive releases have just been added to the Tamashii Nations website! Seen previously as Tamashii Nations 2016, first up we have S.I.C. 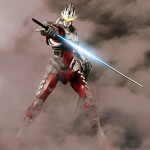 Kamen Rider Shin Zangetsu! The first of the second generation Gaim riders to receive the S.I.C. treatment, Shin Zangetsu looks to be a stellar release. He’ll be priced at 8856 yen. And adding to the surprisingly growing roster of Ultraman Manga releases is the new Ultra-Act X S.H. Figuarts Bemular! The sleek new Bemular was likewise shown off at Tamashii Nations 2016, and will be released as a Web Exclusive alongside Zangetsu in July 2017. Beular retails for 7560 yen. Be sure to get in touch with your preferred Tamashii Web Exclusive middleman or service in the near future to secure your orders for either of these excellent releases. Just displayed late last week at Wonderfest 2016, the Tamashii Web Shop has just updated with official info and images for Ultra-Act X S.H. Figuarts Ultra Seven! Looking every bit as good as the displayed prototype, Ultra Seven (Ultraman Suit Ver 7.2) includes 2 sets of hands, his Specium Sword & sheath, and his Eye Slugger. Ultra Seven has also been confirmed for release as a Tamashii Web Exclusive releasing in August for 6480 yen. Get with your preferred middleman or service today to secure an order. Pre-orders officially open February 12th! While Winter Wonderfest doesn’t always yield a ton of new toku reveals we have our first so far for the show. Just teased earlier in the week and now on display is Ultra-Act X S.H. Figuarts Manga Ultra Seven! 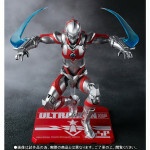 Ultra Seven AKA Ultraman ver 7.2, is set for release as a Tamashii Web Exclusive for August & will retail for 6480 yen. Though currently the total breakdown of his accessories is unknown, Seven will at least include his signature Specium Sword & scabbard. Another surprise reveal has gone up on the Premium Bandai site! This time it’s for another upcoming Tamashii Web Exclusive, a new re-release of sorts. Ultra-Act x S.H. 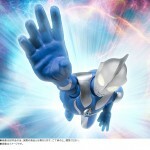 Figuarts Manga Ultraman Special Edition! 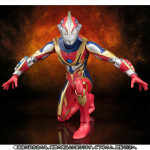 This new figure is actually a re-release of the Manga Ultraman that came out back in July. However those who purchased that retail release figure may feel a bit cheated. Ultraman Special Edition includes several accessories that the 1st release did not. An unmasked Shinjiro head, armblade effect parts, and a personalized Tamashii Stage! Ultra-Act x S.H. Figuarts Manga Ultraman Special Edition will be released as a Tamashii Web Exclusive in May 2016 for 6480 yen! And rounding out the official images of the night is yet another new upcoming exclusive release, Ultra-Act Ultraman Mebius Phoenix Brave! Mebius Phoenix Brave includes several sets of hands as well as the Knight Shoot beam effect as well as a Final Meteor effect piece! 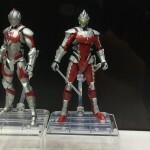 Like the rest of tonight’s reveals, Ultra-Act Mebius Phoenix Brave is set for a March 2016 release as a Tamashii Web Exclusive. Retail price is 5940 yen. Coming as a Tamashii web exclusive this October is Ultra-Act Ultraman Cosmos, star of the 2001 Ultra series of the same name. Based on the character’s default Luna Mode, Cosmos comes packaged with six alternate hands, replacement red colour timer and effect parts for his Luna Extract and Full Moon Rect attacks. He can be yours for the price of 5184 yen. Check out the full selection of pics after the jump!